An eight strand weave with thirty-two pics per inch makes up both the name and the composition of Sufix 832 Advanced Superline. Seven high-modulus polyethylene strands plus a single GORE strand form the braid. One of the few braided fishing lines that truly sinks, 832 Superline is thin and round. The dense weave improves casting distance, reduces vibration, and resists abrasion. As icing on the cake, TPG technology holds paint on 832 Superline longer than other brands. Product: Sufix 832 Advanced Superline. Overall Ranking: 90 out 100. With technology already taking braided lines to new frontiers, it’s innovation that puts the Sufix 832 Advanced Superline on top. Many brands won’t stand up in strand count or in pic count. Other names, like the Power Pro Super 8 Slick, offer competitive options. No other braid, however, makes use of the unique characteristics of GORE. GORE makes up only 1 of the 8 strands in the 832 Advanced Superline weave, but it carries an 8 to 1 impact. Its presence adds durability, line & knot strength, casting distance as well as abrasion resistance. Being a type of polymer, GORE gives the braid some sink. Rapala tests their Superline with thousands of casts in order to back these statements up. A great majority of anglers stand in agreement. Colors: Camo, Ghost (white), Hi-Vis Yellow, Low-Vis Green, Neon Lime, & Coastal Camo. Tests: 6, 8, 10, 15, 20, 30, 40, 50, 65, & 80 lbs. Spool Lengths: 150, 300, 600, 1200, & 3500 yards. Note: Anglers can mix and match any color, length, or test they like within the above parameters. This depends, of course, on availability. 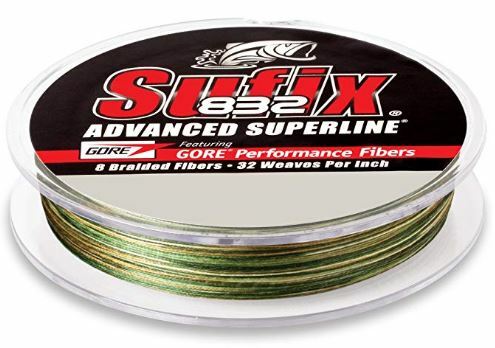 One of the claims Sufix makes about its 832 Advanced Superline is that it’s thinner than other braided lines. Check the line diameters as well as the monofilament comparison below and see for yourself how it stacks up. Dyneema is the main filler of 832 Advanced Superline having 7 of the 8 strands. Much like Power Pro’s Spectra, it’s strong and has very little elasticity. But it’s that one strand of GORE that makes such an enormous difference in how the 832 Advanced Superline performs. So what is GORE anyway? GORE is a composition of molecules known as a polymer, which means many molecules that bond together. In the formation of GORE, Fluorine and Carbon molecules bind together to create PTFE. The process then expands the PTFE (polytetrafluoroethylene), stretching it up to 7 times its original length. This finished product goes by the term ePTFE. GORE is able to create their ePTFE line with different chemical characteristics, and so meet the needs of various industries. For instance, GORE tailors the material in the Sufix 832 Advanced Superline with increased thermal resistance. Its natural qualities make it impervious to water and non-buoyant. The grandiose claims Sufix makes about the 832 Advanced Superline don’t come without skepticism. What braided fishing line doesn’t claim farther casts, abrasion resistance, and better durability? Rapala offers some measure of proof by performing 1,000 cast tests on the 832 Advanced Superline. They put up some impressive numbers side by side against competitors as you can see below. With all the talk of Dyneema and GORE strands, it’s easy to overlook the weave itself. Each inch of Sufix 832 Advanced Superline has 32 pics. A pic represents one weave as the eight strands cross and form their pattern. Sufix manufacturing pulls each weave down tight in order to get 32 per inch. The result is a braided line with a much tighter weave pattern than most of the competition. Sufix calls it their R8 Precision Braiding Technology. A tighter weave adds some stiffness to the line and testing reveals even more advantages. One of the issues that every manufacturer of braided fishing line faces is dimming. Paint doesn’t hold very well on Dyneema or Spectra fibers, nor will ink soak in. Instead of applying paint, Sufix turns to a colored gel which coats each strand. A heating process aids the marriage of gel and fiber, as well as the life of the line’s color. 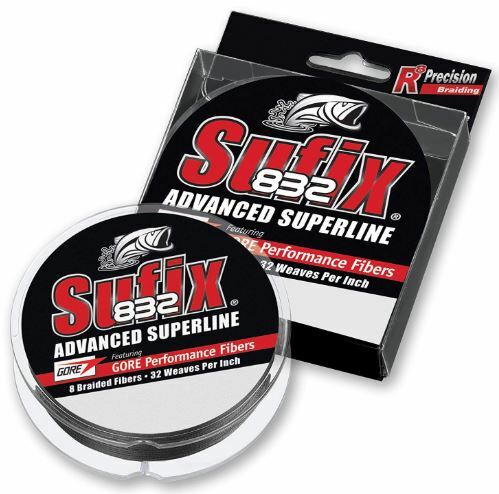 Besides the information already included, anglers discuss several favorite qualities of Sufix 832 Advanced Superline. First and foremost is how strong it is for its size. 832 Advanced Superline is one of the thinnest 8-weave braided fishing lines. And it doesn’t lose any strength because of it. Another factor that anglers appreciate is the smooth casting of the 8-weave braid. There’s very little vibration as the line passes through the rod guides. Finally, 6 different color options give anglers a better ability to match their environment. It’s a bonus that Sufix offers these colors in all ten test sizes and five different spool lengths. Right out of the gate, the biggest drawback of Sufix 832 Advanced Superline is its cost. Like the Power Pro Super 8 Slick, it doesn’t come cheap. Despite claims of extra-long lasting color, angler feedback suggests it doesn’t keep better than other lines. Angler reports also contradict Sufix’ claims of a sinking line, saying it floats just like other products. 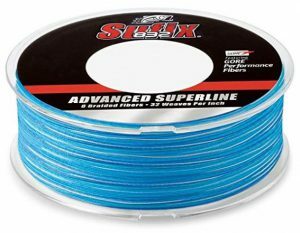 Sufix 832 Advanced Superline offers all the typical qualities an angler would expect out of braided fishing line. It doesn’t stretch to any noticeable degree, is very strong, and it’s thin. A little too pricey for use as a backing, anglers might add a leader of fluoro for spooky fish. 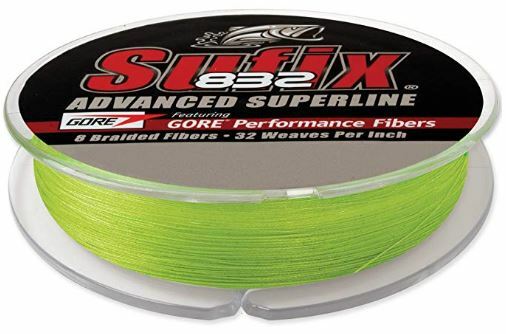 Most offshore anglers prefer to use Sufix 832 Advanced Superline in tests up to 50 lbs. Power Pro seems to perform just as good, if not better, in heavier line sizes. This may be because Power Pro moves up to a 6 or 8 strand weave in heavier tests. Though Sufix braided lines don’t come with a warranty, Rapala does guarantee every product. Their customer satisfaction statement includes a return period of 30 days, no questions asked. Products do require placement in their original packaging and are subject to company discretion. Sufix receives all inquiries, observations, and complaints through their Customer Service page. A high budget tag keeps Sufix 832 Advanced Superline from scoring in the high nineties. Despite the claims of color fading and buoyancy, the list of pros far outweighs the cons. Thin diameter, strength, casting distance, and durability are the prime considerations. A variety of color options, sizes, and lengths are secondary values. What are your thoughts concerning Sufix 832 Advanced Superline? Ask questions or share your experiences in the comment box below.